We provide a full range of legal services in all aspects of wills and probate law. We urge all our clients to make a will, particularly if you are buying property, have a family or are in a civil partnership. By making a will you are ensuring that your estate is passed on according to your wishes. 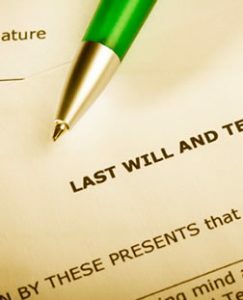 If you fail to make a will then your property passes in accordance with the law on intestacy, your property will not necessarily pass in full to your immediate family and part of your estate may pass to wider family members. We also offer Inheritance Tax Advice and can tailor your will to limit or even remove any tax liability which your loved-ones might be subject to. If you already have a will, we would recommend that you review same every four or five years. It is important to change your will to reflect any changes in your life such as the birth of a child, death of a loved one or breakdown of a relationship. You should also ensure that your executors are capable to act. We also provide an efficient and sensitive probate service. We can handle all aspects of the administration of a loved-one’s estate. If you feel that a loved one is no longer capable of managing their own financial affairs we can either apply for an Enduring Power of Attorney or Controllership on your behalf. An Enduring Power of Attorney can be drawn up by any person at any time but must be executed whilst a person is still of sound mind. This document appoints an Attorney, often a family member, to deal with financial affairs in the event that a person becomes incapable of doing so. The document can be limited to only allow the Attorney to deal with certain assets or alternatively can confer authority to handle all affairs. The document can be registered with the Court Office in the event that a person becomes incapable. If however no such document has been executed prior to a person becoming incapable, it is possible to apply to the Court to appoint a Controller who can deal with all financial affairs.